Replacement of missing natural teeth with fixed prosthesis has been popular these days. Conventional dental bridges are cost-effective in filling empty spaces in your mouth left by lost teeth but these require extensive removal of healthy natural tooth structure from adjacent abutment teeth for achieving stability and support. This problem becomes severe in front teeth which are already relatively smaller in size and dimensions. Albuquerque New Mexico 24 hours emergency specialist cosmetic & restorative dentist Dr William C Gardner at NM Family and Cosmetic Dentistry PC has recently found the best possible solution in the form of resin bonded bridges for saving natural tooth structure during provision of state of the art fixed dental bridges in place of empty tooth sockets in your mouth. Call your Albuquerque New Mexico dentist for more details. Q. WHAT ARE RESIN BONDED BRIDGES? A. Resin bonded bridges are conservative fixed teeth replacement prosthesis luted and glued to the enamel of teeth with the help of composite resin cements following roughening and etching the surfaces with special acidic liquids. It necessitates minimal removal of natural tooth tissues and especially advantageous in intact and caries free abutment teeth. Q. 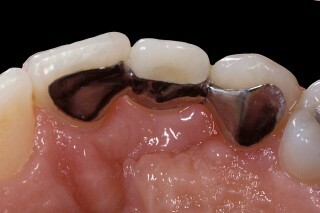 IN WHICH SITUATIONS CAN I OPT FOR RESIN BONDED BRIDGES? • Patients unwilling to undergo surgical procedures such as dental implants. Q. WHAT IS THE PROCEDURE TO GET RESIN BONDED BRIDGES? • Whether adjacent teeth need root canal treatment or not. After complete assessment, it is time for formulation of the treatment plan. Signature is vital for selecting the appropriate shade and minimal or no tooth preparation. An impression of the area and opposing teeth is important. The model is crucial for the art dental laboratory with necessary instructions. The prosthesis gets cementation in the mouth. Thus, this is done with the help of highly adhesive resin composite cement on the next treatment visit. Q. WHAT ARE THE BENEFITS OF RESIN BONDED BRIDGES? • Easier cleaning and maintenance due to margins above the gums level in these bridges. Q. WHAT IS THE LIFE SPAN OF MY RESIN BOND BRIDGE? A. Resin bonded bridges are durable restoration because of excellent success rates. This is depending upon the degree of maintenance, care and follow up visits to your dental health care professional. You need to brush, floss and rinse around your artificial teeth regularly. Repairs are possible if there is a need. Get in touch with Albuquerque New Mexico dentist now. Q. IF THERE IS DE-BONDING OF THE RESIN BONDED BRIDGE? WHAT ARE THE OPTIONS? A. You should not panic if there is dislodging of the replacement bridge gets. This can be because of intake of sticky foods during meal times. Fixing is possible of the bridges by your dentist in the dental office with the help of resin composite luting cements. Thus, call us now and fix an appointment right away!